NB: The version posted on 6 November included a few small errors, which I have now corrected. This is my quick-and-dirty analysis of the state of the US election. 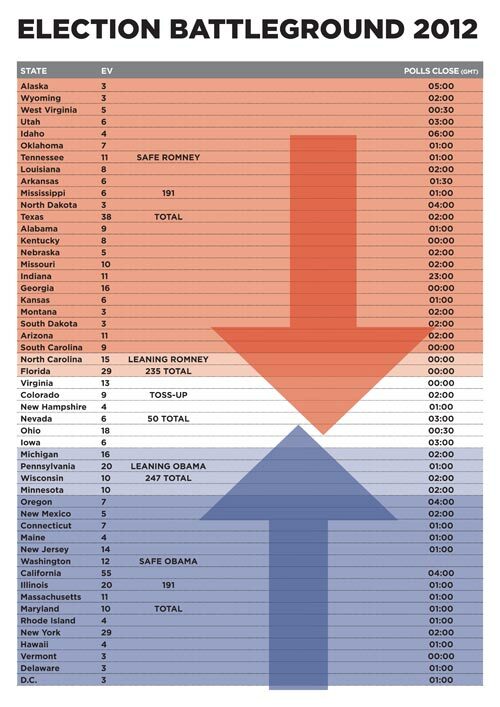 The attached table shows the states ranked by certainty of outcome, with the Republican strongholds at the top, working down to those likely to vote Romney, coming to the toss-up states in the middle, then the likely Obama states and finally the Democratic strongholds at the bottom. This is based on the most recent polling data I could find, but compiled by hand, so there is the possibility of error – let me know if you find one. Assuming it is correct, what does this analysis tell us? Here’s a very very quick guide to the American Electoral College system, just in case you weren’t already up-to-speed. Elections are held in each of the 50 states and Washington DC and each state will thus pick a favoured presidential candidate. Some time after the general election, each of those states will send a predetermined number of electors to the state capital and these people will actually cast their vote for and elect the president. The number of electors per state is roughly correlated with the population of the state, although none has fewer than three. The total number of electors is 538 – the same as the total number of members of the United States Congress. If a candidate wins a state, even by a very small margin, then that candidate wins all of the electors in that state (two very small states allocate their votes proportionally). Winning California is a much bigger prize than winning Delaware since winning California by one vote earns you 55 votes in the electoral college, whereas winning Delaware by a landslide only wins you three votes in the electoral college. Just as some parliamentary constituencies in the UK always vote the same way (safe seats), many states always vote the same way. The small number of “swing states”, where the pre-election polling is very close, are crucial to determining the outcome of the election. With 538 electoral college votes available, a candidate needs 270 to win – although a tie is possible. On my analysis Romney has a clear 191 electoral college votes in the bank – the top red block from Alaska down to South Carolina where Romney has only a six point lead. Romney’s lead is narrower in the next two states, North Carolina and Florida, but he is still the favourite there, which gives him a further 44 votes, taking him up to 235. In order to win the presidency, Romney now has to start taking states where Obama has a slim lead. But even if he wins Virginia, Colorado, New Hampshire and Nevada (where Obama’s poll lead ranges from 0.3 points to 2.8 points) he’s still three votes away without Ohio. Hence Romney’s last-minute pitch for Pennsylvania with its 20 votes. If Romney wins Virginia and Colorado but loses Ohio, Iowa and Michigan, he can still win if he pinches Pennsylvania. Meanwhile for Obama, things look a little more comfortable. He can also count on 191 electoral college votes basically for sure. If Romney wins New York then we’re talking fire and brimstone coming down from the sky, rivers and seas boiling, forty years of darkness, earthquakes, volcanoes, the dead rising from the grave, human sacrifice, dogs and cats living together, mass hysteria. Less certain but still very likely to go Obama’s way are Michigan, Wisconsin, Minnesota and the afore-mentioned Pennsylvania. Those states bring his total to 247, which means that again Ohio marks the turning point. Past Ohio, Obama can count on 271 votes, just enough to secure him the presidency. But look again at the whole of the white area. Having won his near-certain 247 votes, even if Obama loses Ohio and Florida – easily the largest swing states – he can still take Colorado, New Hampshire, Nevada and Iowa and still win, all states where he has the advantage in the polls currently. So, in short Obama will very likely win (although if you are in the US do please, please, please exercise your democratic right to vote, regardless of what outcome you are hoping for) but that shouldn’t stop this from being an exciting night. Polls will start closing around midnight GMT and many states are happy to declare winners long before all the ballots are actually counted because it’s easy to see from a sample what the outcome is going to be. If you’re staying up to watch then around 23:00 GMT the first polling station will close – Indiana. This is a fairly safe Republican state, so expect it to declare for Romney soon after midnight. At midnight GMT, further polling stations close including Florida, North Carolina and Virginia. Virginia is typically quick to count ballots and the race here is very close. A comfortable win for Obama is very good news. A comfortable win for Romney is not terrible news (Obama can win without Virginia) but it’s not a good sign. At 0:30 GMT polls close in Ohio which, as we’ve seen, could decide the whole election. If Ohio is very close, the result may not be known tonight, and there are plenty of scenarios in which Ohio’s 18 electoral college votes are enough to tip the balance. North Carolina is also one to watch. It will likely go Romney, despite narrowly going Obama in 2008. If Obama retakes it, it’s curtains for Romney. At 01:00 GMT Florida and Pennsylvania polls close. If there’s going to be a Romney surprise, then Pennsylvania going Republican could be an early sign of it. Conversely, if Florida goes Democratic, then Romney supporters can pack up and go home – however, Florida may not declare until later – the 2000 debacle still smarts. The race is very tight in New Hampshire, so that could also be one to watch, although it only carries four electoral college votes. At 02:00 GMT, polls close in another 14 states including Wisconsin, where a surprise Romney victory would be disastrous. Also Minnesota and Michigan need a close eye. At 04:00 GMT, polls close in five western states. Chalk up 78 electoral college votes for Obama from California, Hawaii, Oregon and Washington and just four for Romney from Idaho. At this point we should clearly be able to see who has won or that counting will go on for days more. McCain’s concession speech was around 04:00 GMT in 2008. Hope this helps and enjoy the fun.